BT Premiership champions Heriot’s recorded a third win of the season over their Edinburgh rivals and halted a run of disappointing results after abandoning their more ambitious style of rugby for a simpler game. With victories in the Charity Shield and the league to their credit already, the hosts took a patient approach to breaking down a solid Boroughmuir defence, withstood a strong start to the second half by the visitors, then opened out in the closing minutes to take all five league points. The dismal weather played its part in an error-strewn start to the match, with Boroughmuir finding the going tougher than the hosts. Heriot’s were not immune from the odd spillage but coped better in the wet and struck first with 12 minutes on the clock. Boroughmuir won a scrum inside their own half and attempted to move the ball wide but home winger John Rae was on hand to snaffle it and race over for a try. Graham Wilson steered the conversion between the sticks then stretched the lead into double figures with a penalty after a sustained spell of Heriot’s pressure. Boroughmuir had posed little in the way of an attacking threat but were proving tough to break down, though Heriot’s did so in 33 minutes when a searing break by Cammy Ferguson splintered the opposition defence and he offloaded to Max Learmonth who shrugged off the attempted tackle of Edinburgh pro Otulea Katoa to dot down for an unconverted score. Boroughmuir ended the half strongly but failed to score, and they retained the upper hand in the early part of the second period. A series of attacks led to repeat offences that saw Struan Dewar then Jack Turley yellow carded within a minute of each other. The visitors profited from their personnel advantage when Callum Reid crashed over and Dougie Steele converted. 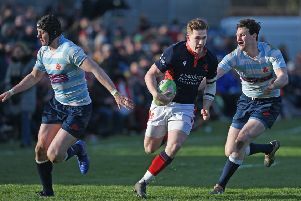 However, Heriot’s struck back with a penalty by Wilson and, with Reid sent to the sin bin, the hosts chalked up late tries by Ian Wilson – converted by his namesake – Charlie Simpson and Murray McCallum to seal the victory that elicited praise from coach Phil Smith.